Catisfaction Guaranteed - or your money back! 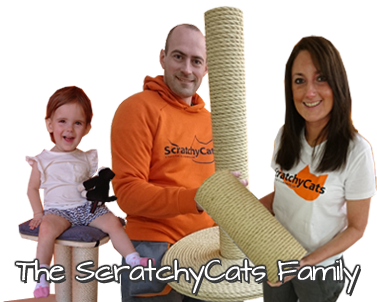 Here at ScratchyCats, we've spent years developing what we believe are the best cat scratching posts available in the UK today. Not only are the products we produce well made and built to last - but they're also built to be functional and that's why every single one of our products comes with our unique to the industry CATISFACTION GUARANTEE. If you or your cat are not entirely satisfied with your cat scratching post and you answer NO to either of the 2 questions below then you're covered by our CATISFACTION GUARANTEE*. ScratchyCats. Unit 2, Buttlands Industrial Estate, Ipplepen, Newton Abbot, Devon, TQ12 5UE. *subject to the following terms and conditions. Any item returned to us that has signs of use and/or damage will not be refundable. If there is partial damage to the returned product you will only be offered a partial refund. We regret that we cannot refund any charges associated with returning a scratching post to us. Arranging return postage is the buyers responsibility. You should ensure the parcel is insured for the correct amount, as any damages incured during return postage will have to be paid for. It is the buyers responsibility to claim compensation for any damages with their own courier.